Check out the upcoming Holiday Party below. Hope to see you there! See some upcoming events below, thanks to the Bridgeview Community Outreach Program Inc. Assumption Family of Schools is hosting an event for families to attend this Thursday, September 21 at 4pm. Come for the food and tour the new middle school facility, along with Assumption high school. 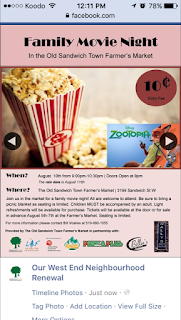 Many community organizations will be in attendance and have booths set up as well. 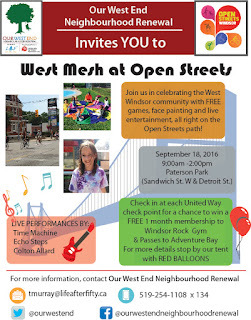 West Mesh and Open Streets Windsor!! Just a reminder that West Mesh and Open Streets is this weekend! Invite family and friends to Our West End’s community celebration West Mesh and enjoy the City of Windsor Open Streets, all at the corner of Detroit St and Sandwich St W at Paterson Park, from 9am -2pm. First day of school has come and gone and now we’re slowly getting into the swing of things. Given the extraordinary transition this school year between the new St. James and the new Assumption Middle School, there have been some inherent challenges that we can expect every time a change of this magnitude is implemented. Although it may be frustrating to some parents, I can advise that teachers, principals, support staff and administration are working hard to rectify any issues that pop up. As your trustee, it is my duty to inform you of the status of our schools in the west-end and to express your concerns to our administration to ensure that your voices are heard. That is what I’ve always done and that is what I’ll always continue to do. With that in mind, I intend to provide you with a school status report, beginning with St. James. Updates on School Projects and Great News for the West-End! I've received many questions from residents regarding the status of construction at St. James and Assumption Middle School. The trustees have received periodic updates throughout the summer and have asked questions regarding the same updates to ensure that the projects are moving forward accordingly. Children under 12 are welcome if accompanied by a guardian. I received an email from west-end resident Jerry Gervais who provided me with information on how to donate to the Tecumseh-Brock Sculpture. See the details below and to learn more about this project, see the link below as well. You should make the cheque payable to the City of Windsor and in the subject line identify that it is for the Tecumseh Brock sculpture. The cheque could be mailed or dropped off at the mailing address below and should be sent attention to either Cathy Masterson or Mike Clement. They can ensure the correct paperwork is filled out to receive a tax receipt and the deposit of the cheque into the correct capital project. Our West End would like to extend our sincerest Congratulations to the Executive Director of Life After Fifty, Calvin Little on his upcoming Retirement August 31st, 2016! 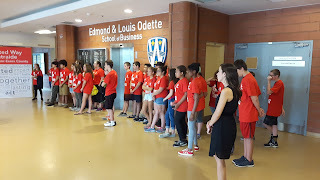 Cal was instrumental in supporting the initial pilot of Our West End as a grassroots community engagement initiative, and providing an organizational home for Our West End as a program of Life After Fifty funded by United Way Windsor-Essex County. There is a lot going on in the coming months. See below! Good Day for the City's Core and the West End! See an article from Anne Jarvis regarding the recent decision made by city council to waive development charges for several neighbourhoods in the city, including the west-end! Our West End looking for residents to participate in an ongoing Safety Committee. See an email I received from Tammy Murray, Community Coordinator at Our West End. Our West End Neighbourhood Renewal is looking for West End residents to participate in an ongoing Safety Committee. The goal of the committee is to connect residents together to look at areas of concern in the four West Windsor neighbourhoods, and use crime prevention techniques to reduce the opportunity for crime to occur. This will include: training residents how to do safety audits, talking to neighbours about crime prevention, helping to connect your neighbours to our projects encouraging the use of porch lights/reporting of crime, planning safety projects and prioritizing where our next clean-ups/beautification efforts will take place. 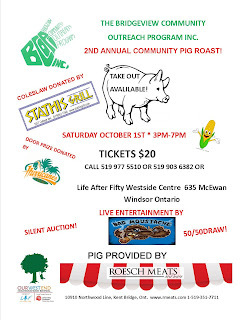 Bridgeview Community Outreach Pig Roast! 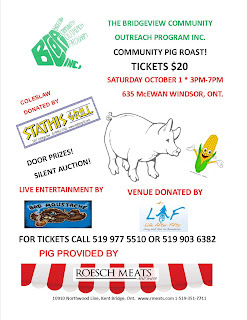 The Bridgeview Community Outreach Program is hosting a pig roast in less than two months. Get your tickets while the last! See the flyer below. Please be advised that on Thursday, June 2nd, a “Town Hall” meeting will be held at Assumption College Catholic High School to discuss the implementation of the Assumption College Catholic Middle School programme. The Town Hall meeting will take place at 6:00 pm in the cafeteria. There will be a brief slide show presentation about the programme, which will be followed by an opportunity for parents/guardians to ask any outstanding questions that they may have. We hope to see you there! Please see an email I received from the parent council chair regarding volunteers needed for June 2nd, 3rd and 4th. "June 2nd, 3rd and 4th the Assumption parent council will be selling parking spaces in our parking lot for the OFSSA track and field event being held at the University of Windsor. There is a potential HUGE profit to be made with 2700 athletes coming into town. We need to staff two payment booths and 3 barriers for Thursday and Friday, and two payment booths on Saturday. In addition we will need parking lot attendants to ensure people are parking in the right places and not blocking others in. We would also like to sell water and snacks to the THOUSANDS of people that will be around that weekend. There will be spaces for volunteer parking in the lot.
" Looking for delivery personnel for Pharmasave Westside Pharmacy. See below some of the things Cardinal Place in Sandwich Town is doing for seniors in the west end and beyond. 1.Father’s Day Brunch and Open House, Sunday June 19, 10 a.m. to 2 p.m. ONLY $10 including HST. At 3140 Peter Street, between Detroit and Mill. 2.Spa Day for Seniors living at home: ONLY $35 for hair cut & style, assisted bath in our walk-in spa tub, lunch (optional pedicure and manicure) Call 519-254-1112 for details. 3.Day Away Program for Seniors living at home: morning exercise and/or activities, lunch, afternoon activities. 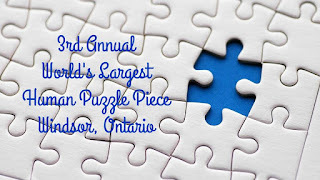 Call 519-254-1112 for details. You've probably read the series put on by the Windsor Star this past week featuring Sandwich Town. If you haven't, you really should, it's excellent. You will learn about all of the amazing things happening in Sandwich Towne and also learn about the looming issue with the Ambassador Bridge Co. I've pasted the links below in chronological order for your convenience. Today, the Supreme Court of Canada heard the submissions from the City of Windsor and the Bridge Company and will render a decision sometime in the future (hopefully sooner than later). I am hopeful that the SCC will provide justice to a neighbourhood that has been for too long a victim of one man's financial ambitions. Buying into history: there’s a buzz in Sandwich A microbrewery becomes a catalyst Irreplaceable Sandwich post office getting a $1-million makeover The Ambassador Bridge casts a long shadow You can buy houses and nobody can do anything about it? Please Wear Blue for the Human Puzzle Piece formation!! Group Puzzle Piece Picture from the fire truck at 4pm!!! A great family day!! I received an email from a west-end resident notifying me that his partner's car was broken into last Friday. They live by Riverside Dr. W. and Askin Ave. Please keep a lookout and always notify police if you experience or see anything suspicious. 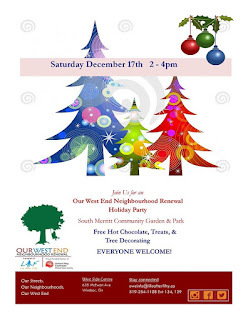 Check out the Our West End Newsletter below. A big thanks to the organizers, volunteers and funders for all that you do. I've received several calls from concerned parents and residents around the St. James area. I've met with the Principal of St. James and together with the St. James Parent Council, we've brainstormed some ideas to help alleviate some of the traffic concerns around drop-off and pick-up times at St. James. The issue is also being addressed across the region with a joint city and school board committee. I look forward to seeing the results of that committee and how we may be able to apply their recommendations to St. James. St. James is a neighbourhood school and as such, was never designed for the amount of car pick-up and drop-off currently being experienced. We must encourage more walking to and from school to not only help alleviate congestion, but as a healthy alternative for parents and their children. 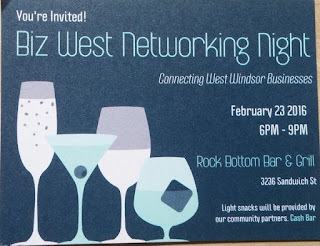 Rock Bottom Bar & Grill is hosting a networking event on February 23rd. See below for details!